Admit it. You are moving to Tampa for the beaches. If you aren’t, you actually are and you just do not know it yet. With an average of 361 sunny days a year and some of the most beautiful, most highly-rated beaches in the country, get ready for best tan or worst sunburn of your life. Along with Orlando and Miami, Tampa draws a large percentage (1/3 in this case) of Florida’s population within two hours of its center. With such a large population, Tampa has a multi-faceted economy that is much more than just that of a tourist spot. Tampa is a thriving agribusiness center with citrus, beef cattle, dairy products, eggs, vegetables and two of the U.S.’s most famous breweries: Pabst and Anheuser-Busch. Yet, Tampa is well-versed in other economic forms. For example, it has a strong tech presence and is a part of the Florida High Tech Corridor, an entity that seeks to grow the high tech industry through partnerships that support research, marketing, workforce and entrepreneurship in areas such as Modeling and Simulation, Optics and Photonics, Digital Media and Medical Technologies. Tampa is also home to the MacDill Air Force Base which happens to be one of Tampa’s largest employers with about 14,500 employees. If you want some fun facts about MacDill AFB, it contains 19 Aircraft that are worth over $1 billion and is also home to senior officers that represent over 50 nations that have partnered with the U.S. after 9/11 with the objective to provide world safety. If you are relocating to Tampa for the MacDill AFB, you will have a good number of options for convenient locations that will let you stay social, but be close to work. South Tampa, where the base is located, is a good place to start apartment searching and since there is such large personnel, living options are available in the form of apartments for rent (some with utilities included), houses for rent, and many other living facilities. 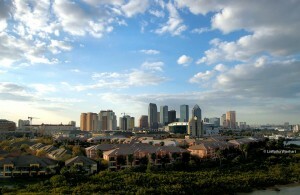 However, being only eight miles south of downtown Tampa allows for lots of other options. Between Channel District and Downtown Tampa, living in Tampa’s center has something to offer everyone. The city’s financial corridor is located within downtown and acts as one of Florida’s major financial hubs. Meanwhile, the Tampa Bay Times forum is downtown where you can catch a Lightning game or one of the many music artists that pass through. There are museums spaced throughout the city such as the SS American Victory, a museum ship that served in both WWII and Vietnam. In fact, out of 534 Victory ships made, the SS American Victory is one of the remaining three. Meanwhile, you’ll find fun, eclectic shopping in the Channel District which is also rich with high-rise apartments and luxury apartment towers as well as converted warehouses. West of Downtown and right across the Hillsborough River is the University of Tampa, home of the Spartans. Luckily for apartment finders, despite being so close to downtown, UT’s immediate neighborhood is inexpensive. There are a variety of houses for rent and cheap apartments near the campus that will make getting to class easy. SoHo and Hyde Park have been making a name for themselves as the destination of millennials and young professionals looking for a highly-walkable area that is still close to Tampa’s center. The area offers fun things to do any time of the day. From long walks on the beach with your pup on pet-friendly Bayshore Boulevard, tons of local eateries such as the Roux (Cajun/Creole), pubs and bars like MacDinton’s and Ciro’s Speakeasy and Supper Club that are perfect happy hours, it’s pretty easy to take advantage of the beach cruiser life and enjoy Tampa’s mellow temperatures. Many of these places are found in Hyde Park Village, the lovely core of the neighborhood that incorporates a park, fountains, walking trails and its many boutiques and retailers. There’s a good mix of studio apartments with all bills paid, multi-family apartment communities, and homes for rent scattered throughout these neighborhoods. The area has a high demand due to its excellent walkability and safe neighborhoods, so try using an apartment search site – like RentLingo - (as opposed to Craigslist) to narrow down your results most accurately. Ybor City, known as Tampa’s “Latin Quarter” could be considered an up-and-coming area in Tampa. During the 90s, the area saw the development of many bars and nightclubs, and with community reviews often citing it as the center of Tampa’s party scene. In recent years, the community has focused on developing Ybor City into a destination not only for twenty-somethings on the weekends with the creation of family-oriented shopping complexes, movie theaters, and the restoration of older buildings and hotels. RentLingo is your trusted apartment finder in Tampa. We hire local experts, such as former property managers and locators to anonymously tour and consistently rate and review every available place. They share their honest and unbiased perspective with you, so you know how every rental ranks in the area. Because our experts tour every property, we can offer consistent apartment ratings across every region. So unlike finding a Backpage or Craigslist rental, you can trust these apartments are verified and trustworthy: whether it's a cheap studio or a one bedroom with all utilities paid all the way up to a nice house for rent or a luxury condo.